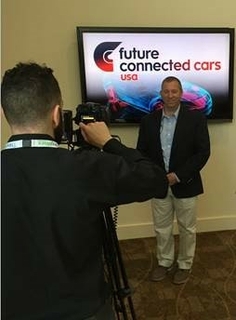 Last week, Tim VanGoethem, vice president of HARMAN’s Infotainment Platform Group, and Jason Johnson, director of User Experience, participated in Informa’s Future Connected Cars USA conference in Santa Clara, CA to discuss the latest trends and issues impacting connected car innovation. Tim VanGoethem took part in a group talk titled, “How to behave like Apple and Google: What should you adopt and is this the right strategy?” As part of this panel, Tim, along with Uwe Higgen, head of Group Technology Office USA at BMW, assessed the future of tech giants in the automotive space, the intersection between Detroit and Silicon Valley and the extent to which automakers should be investing in Silicon Valley research and office presence. Also at the conference, Jason Johnson presented on HMI displays and the need for simplicity in design to deliver a frustration-free experience for drivers and passengers in in-car technologies such as voice and gesture recognitions. For more on the Future Connected Cars Conference, click here.